I love a good pesto during the summer. In the past I have not had particularly great success with making my own pesto. I just never felt like I got the flavor and texture correct. And now, since going dairy-free, I have to consider pesto without the Parmesan cheese. I decided to mesh a couple of recipes together to create this dairy-free pesto to go over a roasted tomato and white bean pasta dish. It was delicious! 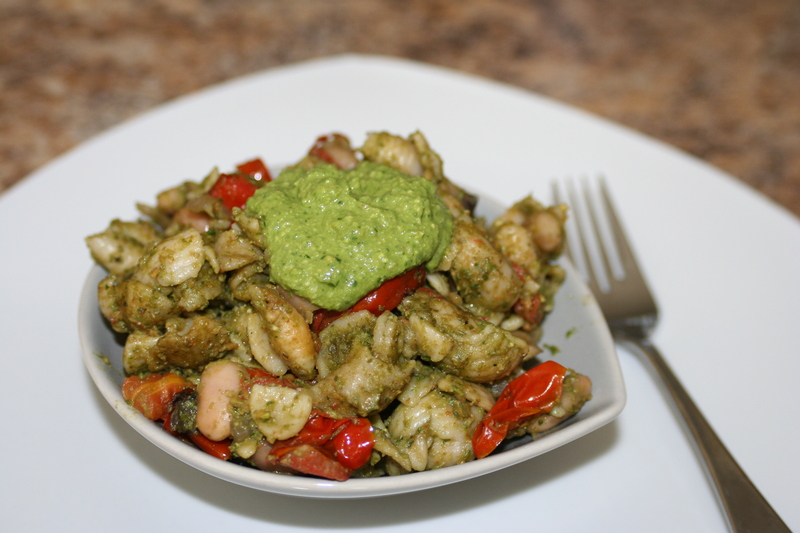 And the leftover pesto is great for topping homemade pizza or using for a pita bread dip. Add the spinach, basil, walnuts, garlic, and lemon juice into the bowl of a food processor. Pulse until everything is broken down into small pieces. Add the nutritional yeast, olive oil, salt, pepper, and cayenne. Whirl until the pesto is smooth.